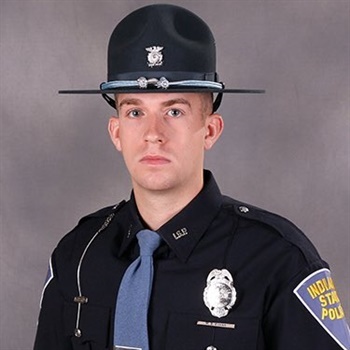 An Indiana State Police officer was expected to survive after being shot in the head Tuesday night while trying to apprehend a suspect, officials said. Indiana State Police said the incident happened just after 7 p.m. in Jeffersonville, located across the river from Louisville, when Trooper Morgenn Evans stopped a gray 1999 Chevrolet Silverado driven by 79-year-old Oscar Kays. Kays became combative during the traffic stop, police said, eventually pulling a gun on Evans and then shooting him, reports Fox News. Evans was "struck in the head," but managed to return fire, according to ISP. Kays fled the scene, but the injured officer was able to pursue him for a short time before Kays was able to escape. Authorities were able to arrest Kays at his home a short time later. Evans was taken to the University of Louisville Hospital with non-life-threatening injuries, state police said. He was released from the hospital Wednesday. Kays was also transported to the University of Louisville Hospital with unknown injuries, and was charged with attempted murder of a police officer.